Digital extravaganza to feature free comics, digital contests, and attractive prizes! Wouldn’t we all love to run faster than a speeding bullet, fly through the skies and use superhuman strength to battle bad guys to save the day? While all these experiences may not be for us mere mortals, we can surely live them vicariously through the exciting worlds of our favourite superheroes and our beloved comic books. Enabling more comic book fanatics and fantasy lovers to revel in their obsession with graphic storytelling and the universe of pen and ink, Comic Con India is launching the 2nd edition of its Fandom Month. This unique digital extravaganza will feature exciting digital contests ranging from Trivia, Fan Art, and the Superfan Hunt as well as free comics and updates from the world of popular culture to keep participants hooked and asking for more! Comic books have long been an incredible window into the world of adventure and fantasy for millions of people across the world. Young and old alike have been transported to alternate universes where the eternal battle between the forces of good and evil play out in a million different entertaining ways. No wonder then that Comic Con India has had such great success in attracting old and new fans to this genre of entertainment. 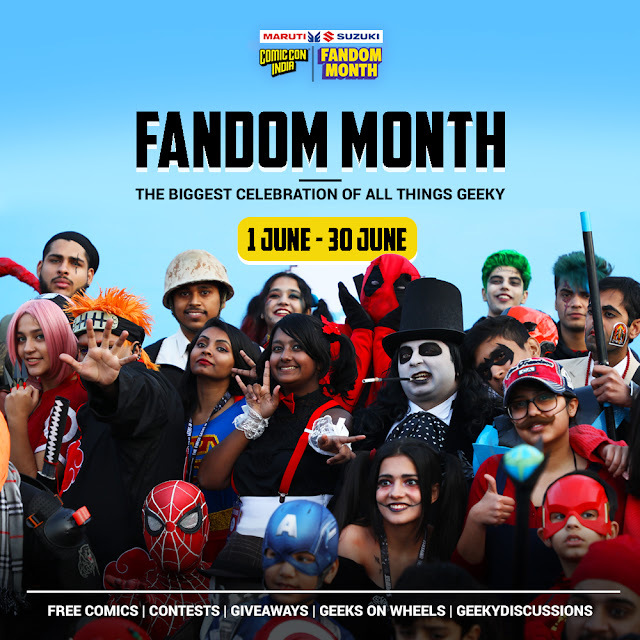 The Comic Con India Fandom Month is the extension of the brand’s ‘Free Comic Book Weekend’, a successful initiative that was transformed into a month-long celebration of comics with lots of activities for fans in the run-up to the Comic Con season, slated to happen later in the year. As part of Fandom Month, fans will have the opportunity to read brand new comics from the best comic book artists in the country for free! Further, there will be four weekly contests, with each paying homage to amazing fictional universes like Harry Potter, Stranger Things, Batman, and Game of Thrones. Contest winners can win vouchers worth INR 10,000 every week. The Super Fan Hunt will give comic book readers the opportunity to be crowned the ultimate pop culture super fan, and the four winners – one each from Delhi, Mumbai, Hyderabad, and Bengaluru – will win 10 Super Fan passes to attend their city’s Comic Con in style with their gang. Fans with a flair for art can participate in the Fan Art Contest, where the public will vote on submitted artwork and the winner will grab a Wacom tablet. For the first time, Comic Con India’s Fandom Month will also cater to automobile geeks, giving them a chance to become a comic book hero in a strip drawn by a renowned comic book artist from India! Participating fans will have to share their favourite story of an adventure featuring iconic Maruti Suzuki cars, and the best story will be immortalized in a special comic drawn for the participant. To take part, all fans have to do is go tohttp://www.comicconindia.com/f andom/ and enjoy the fun.